Little Shivu became ill right after Sankranti. 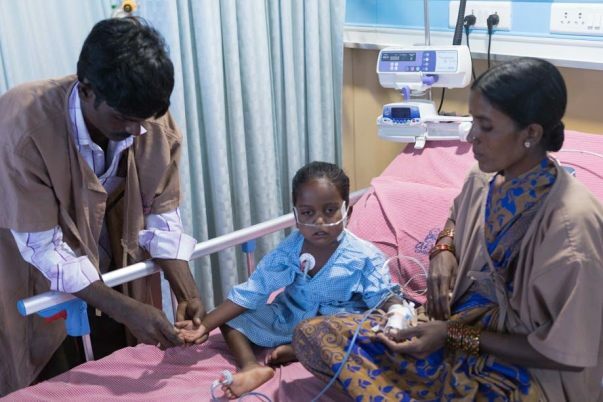 The 4-year-old has a kidney infection and his condition is so bad that his parents had to rush him to a hospital in Hyderabad. Shivu is in the ICU, clinging to life. 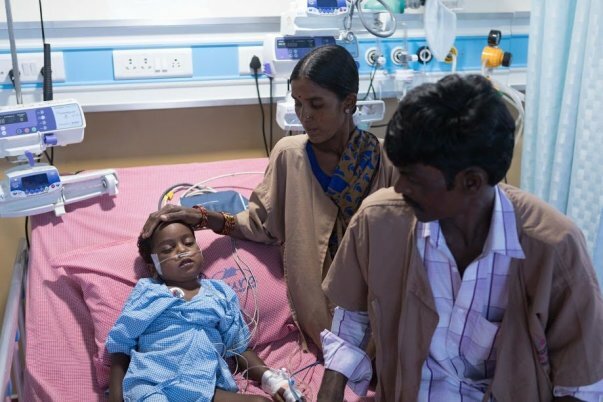 His parents – tenant farmers in Bidar, Karnataka need help saving their baby. Shivu is the baby of his family. On a normal day, he is found happily playing with his older brother Babu (8). Shivu often sneaks off Babu's school things and pretends they are his. He is waiting for the day he too begins school like his older brother. 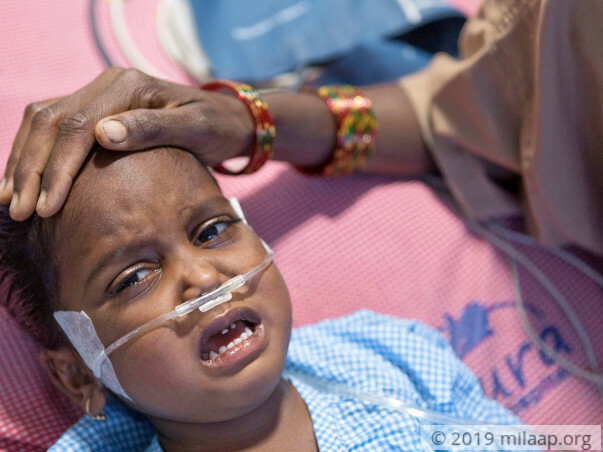 But last month, Shivu fell sick and instead of recovering, his condition started to rapidly get worse. To his parent's shock, he woke up with a swollen face and stomach. Soon he started having bad fits and then went completely still. It is a moment Shivu's parents Prakash and Punyavati still recall with horror. “That moment when he stopped moving, I felt like the world stopped. My wife started sobbing next to me, but my mind simply stopped. So many thoughts went through my head. I could only breathe again when there was a slight movement in his hand. We took him to the doctor immediately,” he says. 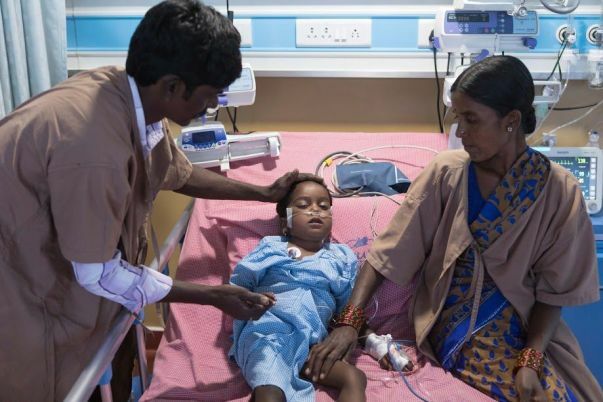 When taken to the nearest clinic in Bidar, the doctors realised that his condition was critical. He had stopped breathing on his own and needed ventillator support. But Shivu needed better critical care and his parents rushed him to a hospital in Hyderabad in the middle of the night. 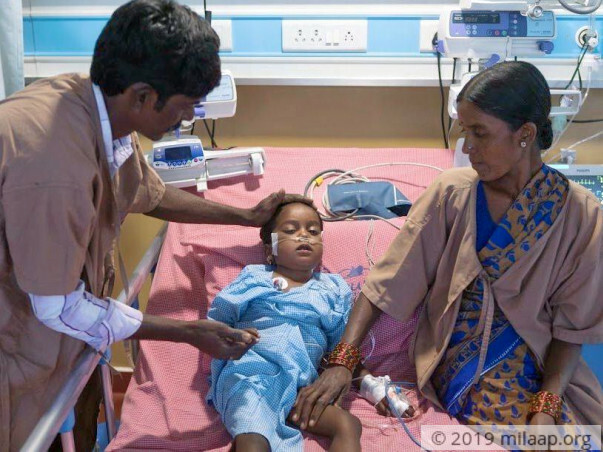 In Hyderabad, Shivu was found to have a serious kidney infection and inflammation. The high blood pressure and the seizures were caused by the severity of his condition. Though he doesn't yet speak in full sentences yet, he kept crying and telling his parents that his head hurt. Thankfully, Shivu's condition has stabilised and his blood pressure is going down. To his parents, this is nothing less than a second life for Shivu. They are grateful that Shivu is better but they are still worried about being able to save him. Prakash and his wife Punyavati are both daily-wage workers who do farm labour for wages. They are able to earn only when they find work for the day. They barely managed to make ends meet and an emergency like this has caught them completely unprepared. His children are everything to Prakash and he managed to secure Rs 1 lakh which is all gone now. 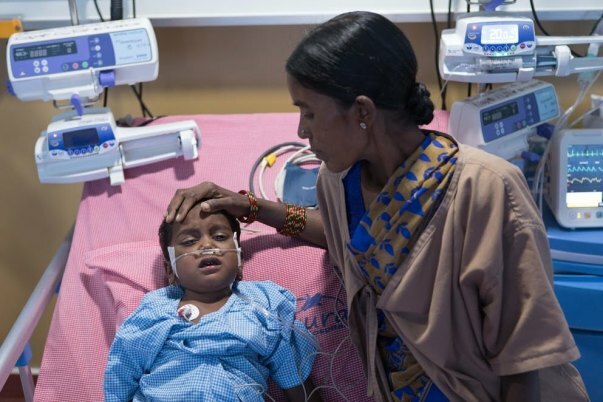 Shivu's extended stay in the ICU will cost the family another Rs 4 lakhs. 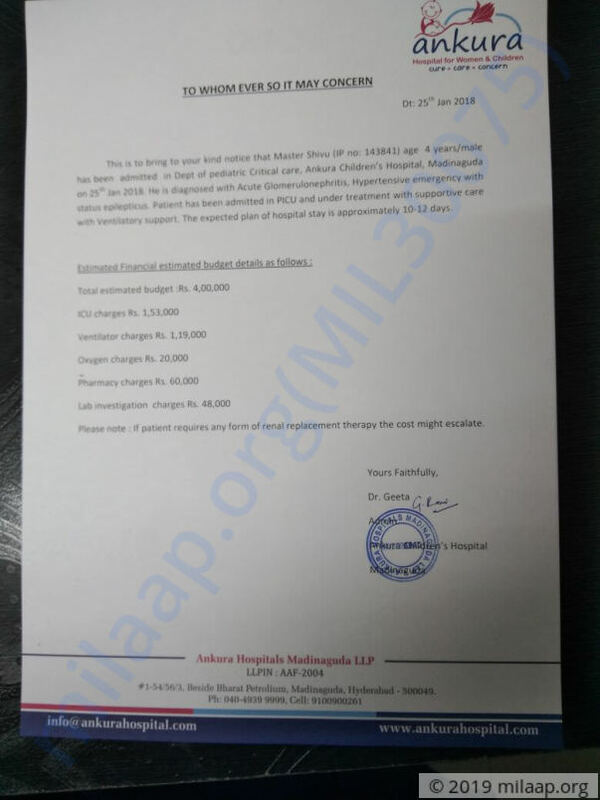 Prakash has no way to meet this crucial expense to save his son. He needs urgent help saving his little child. The fear and trauma of almost losing Shivu, has made Prakash even more determined to save his child. He can't imagine going back home to Bidar without the happy Shivu in tow. 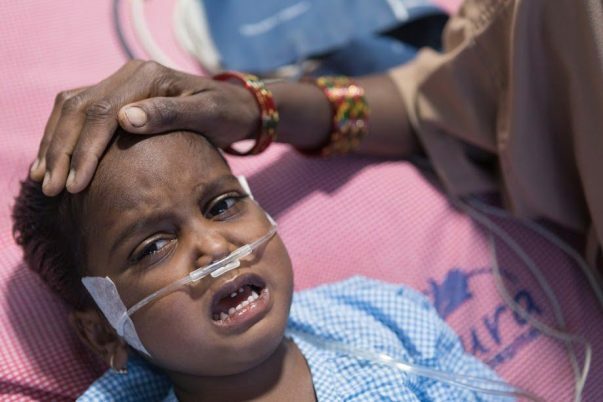 He has borrowed heavily to fund Shivu's treatment so far, but Shivu's battle is far from over. Contribute to save this young child from a painful disease. Shivu was discharged recently from the hospital and currently he's doing well at home. His infection has been cured but still the doctors have suggested regular inspections for him just to keep a check. As of now, he remains active at home like any other normal kid and the We are finally relieved to have our son back. I and my wife, sincerely thank each one of you for the love and support which you have shown towards my son. We will always be grateful to each one of you. May God bless you all. May almighty Allah grant Shivu a very healthy life.